West Coast League president Dennis Koho announced the league's All-Star Game rosters this morning. The North squad - made up of Kelowna, Victoria, Bellingham, Walla Walla, Wenatchee and Yakima - will be managed by Ed Knaggs, the skipper of the Wenatchee AppleSox. The South team - compromised of Kitsap, Cowlitz, Corvallis, Bend, Medford and host Klamath Falls - will be coached by Gems' manager Mitch Karraker. The most represented colleges on this year's All-Star Game rosters are Gonzaga with 3, and Arizona State, Creighton, Long Beach State, Lewis-Clark State College, Linfield College, Oregon and Portland with two each. For info on West Coast League All-Star Game events, please click here. 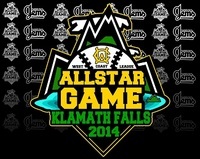 The WCL All-Star Game Home Run Derby on Monday, July 21st is slated to start at 5:10 pm, with first pitch at Kiger Stadium in Klamath Falls, Oregon scheduled for 6:35 pm.